Can I Safely Whiten My Child’s Smile? The most convenient solution to resolve stained teeth involves whitening toothpastes. They are easily available over-the-counter and are effective for slightly improving surface stains. Be aware, they will not change the color of teeth that are naturally dark in appearance. Although the toothpastes are safe, they are abrasive, which allows them to polish the teeth while also dissolving stains. Unfortunately, the abrasiveness of the toothpaste can breakdown your child’s enamel if they are used too often. If you choose to use a whitening toothpaste for your child, use it in moderation and do not expect there to be a drastic improvement to the color of their teeth. Professional teeth whitening from your dentist in Arlington is not just suitable for adults but children as well. The application uses carbamide peroxide or hydrogen peroxide to gently lift stains to get their teeth several shades whiter. If you are considering a whitening kit, the American Academy of Pediatric Dentistry recommends you avoid those that can be purchased over-the-counter. Instead, it is best to consult with a dentist because they can control the whitening process to ensure it is safe and effective. Although whitening treatments are safe when used according to the manufacturer’s guidelines or under the supervision of their dentist, it is best to wait until your child’s enamel in their permanent teeth has fully calcified. This generally takes about 2 years to occur after an adult tooth has fully emerged. If your child uses a whitening treatment before all their permanent teeth have erupted, it can destroy their tooth enamel and damage the gingival tissue. 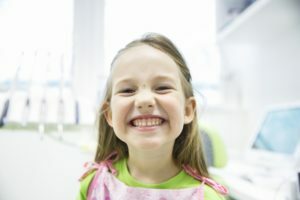 Whether you choose an at home product or a professional treatment, it is best to always consult with your child’s dentist in Arlington first to avoid causing any potential damage to their teeth and gums. They can help you safely and effectively invest in your child’s confidence with a bright, beautiful smile. Allheart Dental Implants & Orthodontics provides complete dental care for patients of all ages from our modern dental practice. We offer the services our patients need through all stages of life to protect the health of their teeth and gums. Besides general dentistry, our practice also provides specialty services, like cosmetic dentistry. We have the solutions you need to treat tooth discoloration. Contact our office today to learn more about using whitening treatments to brighten your child’s smile.